Traditional singers enliven the atmosphere at many wedding parties. 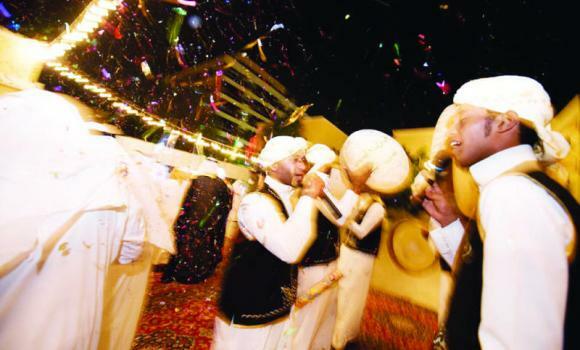 Wedding halls in Jeddah are 90 percent booked as the busy summer holiday season approaches, owners told Arab News on Wednesday. Many people get married, hold birthday parties or other celebrations during summer, they say. Hassan Dlaimi, the owner of a hall in Jeddah, said he has stopped taking bookings until after Dhul Qadah. “People tend to have their parties during Shaban, Shawwal, and Dhul Qadah. In Ramadan bookings fall to under 50 percent because of the long-standing habit of people in Jeddah to shy away from having any wedding celebrations in this month, except in very rare cases,” he said. Abdul Rahman Khalid, a Jeddah resident, said he had difficulty getting an early booking for his wedding party. “I had to make it just before Ramadan, because all halls are fully booked up until Haj. Actually, I had wanted to have my wedding party after the previous Haj season because there is not much demand then. I embarrassed myself in front of my in-laws because we had to cancel previous arrangements,” he said. A Ministry of Commerce source said inspectors regularly check whether wedding hall owners abide by officials prices. “The result of the tours was that we issued warning notices to 35 of these halls, fined 20, and shut down 15 because they charged more than the official rate,” he said.